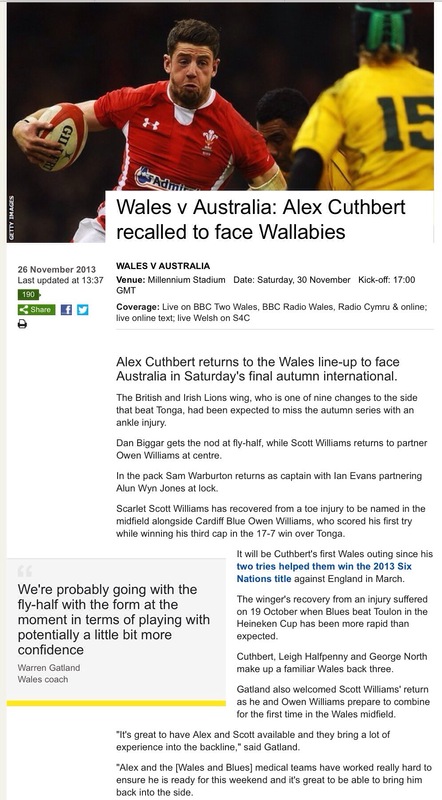 Can Wales finally defeat Australia? The waiting is nearly over. At 5pm today, Wales will take on Australia in the long anticipated showdown between the two countries. As the table below shows, including the match at the World Cup in October 2011, Wales have played Australia a total of 6 times in the last two years, and have lost on each occasion, usually narrowly. Of the three Southern Hemisphere “superpowers”, Australia are the country Wales have beaten the most, and the country Wales have beaten the most in the professional era. Having won the 6 Nations in March by annihilating England 30-3 in the final match, and a successful Lions’ tour where Wales contributed 10 of the starting lineup in the 3rd and decisive Test, beating Australia today could cap a very successful 2013 for the Welsh team and for Warren Gatland and his coaching team. I also believe that, if we win, it will really boost our confidence ahead of what I expect to be a very competitive 2014 6 Nations. Thankfully we will have Alex Cuthbert back in the team, and despite our injury problems in the centre I believe Wales are fielding a very strong team. I saw yesterday morning that the Wallabies coach Ewen McKenzie has ratcheted things up nicely by saying that Wales are “worried” about falling to their ninth straight loss to Australia. Certainly it’s not a good record. 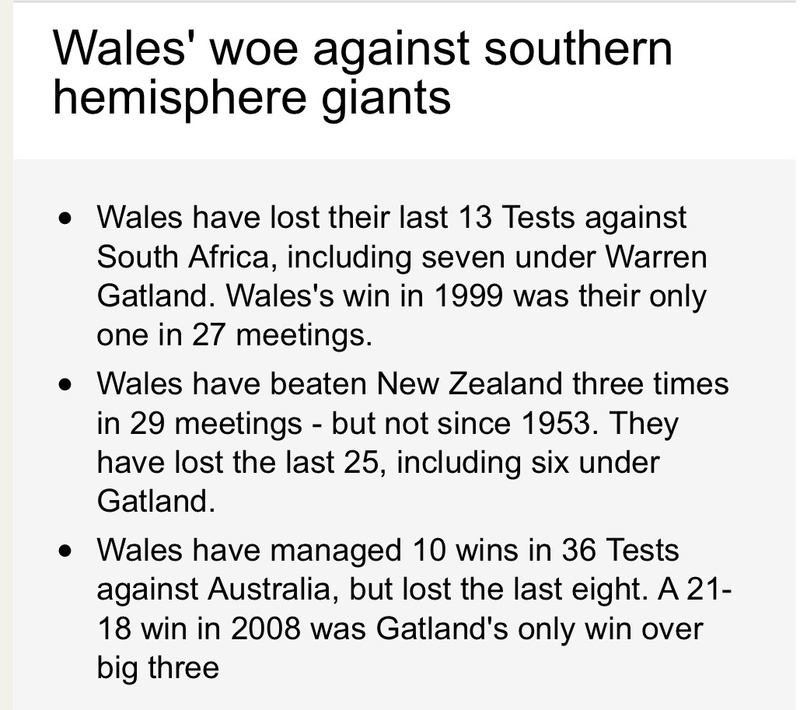 Wales have a woeful record against the three Southern Hemisphere “giants”. England look resurgent, and France and Ireland also look vastly improved from earlier this year. The 2014 6 Nations sees Wales play England in Twickenham, which is a place we have only won 3 times in the last 25-odd years. Beating Australia today will boost Wales’ players’ confidence hugely, and Wales are very much a team whose style of play works so much better when they are playing with self belief. So DERE ‘MLAEN CYMRU, let’s beat Australia today and get that particular monkey off our back! 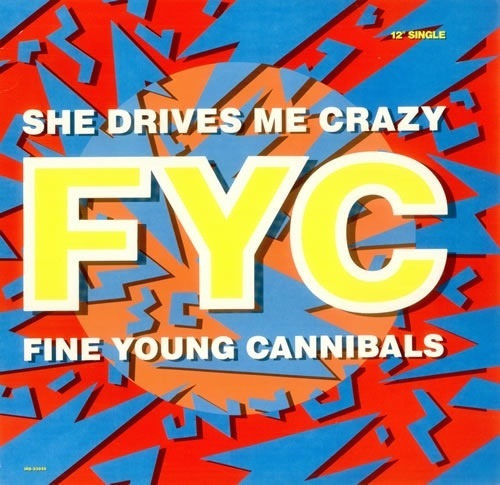 Today I thought I would post this great song, “She Drives me Crazy” by Fine Young Cannibals. This was a hit in 1989, reaching number 5 in the Disunited Kingdom and number 1 in the USA. It is from their 1988 album “The Raw and the Cooked”. Which is your favourite Fine Young Cannibals song? Each week, in the free Metro newspaper is an excellent “science and discovery” feature called “MetroCosm”. It is by Ben Gilliland, whom from what I can remember reading is not a trained scientist at all, but he certainly has a gift for explaining complex scientific ideas clearly and succinctly. He has a web page, which can be found here. Last week he had a very good article about Dark Matter, the elusive component of the Universe that we think comprises some 85% of all the matter there is, but which only announces itself through its gravitational effects. Finding out what Dark Matter is is one of the many challenges facing physicists and astrophysicists, and Ben talks in this article about the negative results obtained by a recent experiment to detect dark matter particles (the particles called WIMPs, I blogged about them here). 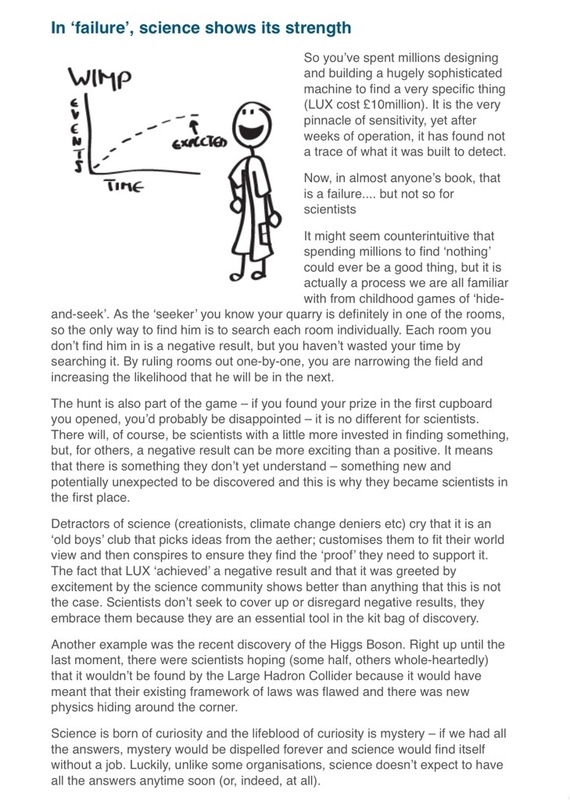 The part of the article I enjoyed the most is the part I have illustrated below, which talks of how science advances through “failure” as much as through success. Really an experiment is never a failure, unless it is done incorrectly. Even results which do not go the way scientists expect means the scientists can learn from the experiment. Thus, the negative results obtained in searching for WIMPs will help scientists refine their future searches, it is not a wasted effort. As Ben Gilliland so correctly says, scientists can learn just as much (and sometimes more) from a negative result as they can from a positive one. As Ben so rightly says, this is like the negative results one obtains in playing hide and seek. If one goes into a room and determines that no-one is there, this may be a “negative result”, but it is not a wasted effort as it tells you that you have already explored that part of the house. In science we explore in experiments what is technically called “parameter space”, which may in this case be the energy of the WIMPs, their mass (which is related to their energy), or the method we are using to detect them (which will depend on how they interact with normal matter). And, as Ben also says, negative results can sometimes be greeted with even more enthusiasm by the science community than a positive result, as it can point towards a new theory that needs to be developed, possibly uncovering a deeper understanding of the underlying science. So, scientists are amongst the few who can, sometimes, welcome “failure” (negative results). And, without exception, we always learn from our negative results. 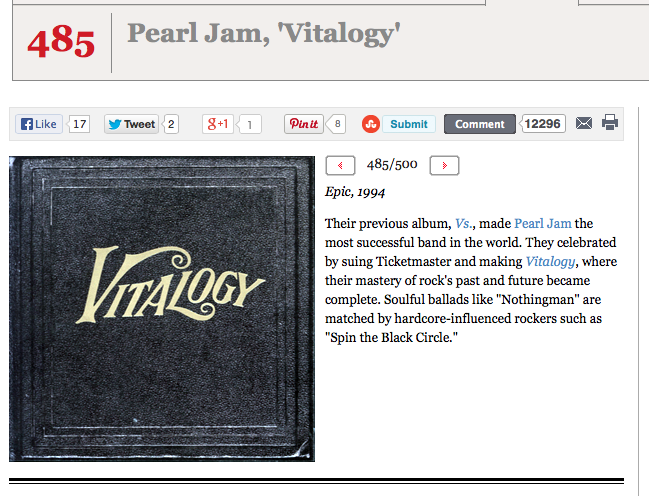 At number 485 in Rolling Stone Magazine’s 500 greatest albums of all time is “Vitalogy” by Pearl Jam. Here is the list of albums from 490 to 481. “Vitalogy” is the only album in this list which I own. I have heard of ZZ Top, Kiss, Cyndi Lauper, Earth, Wind and Fire, Mott the Hoople and Steve Earle, but do not own any albums by any of them. I do know some of the hit songs that ZZ Top, Cyndi Lauper, Earth, Wind and Fire, Mott the Hoople and Steve Earle have had, and I even have a few of those songs on my iPod. Although I have heard of Kiss, they are very definitely not my kind of music; synonymous with the worst of American rock in my opinion. I have never even heard of Hüsker Dü, Gang of Four or D’Angelo, let alone heard their music. At number 485 in Rolling Stone Magazine’s 500 greatest albums is “Vitalogy” by Pearl Jam. “Vitalogy” was released by Pearl Jam in 1994, and I bought the album the same year, on the strength of the single “Better Man”, which was one of my favourite songs of 1994. The album reached number 1 in the USA and quite a few other countries. In the Disunited Kingdom its highest chart position was number 4. The song “Better Man” reached number 1 in the US “Billboard mainstream rock” chart, spending a total of 8 weeks at number 1. As I was living in the US at the time, I have no idea if it was released as a single in the Disunited Kingdom. The words and music to “Better Man”were written by Peal Jam’s lead singer, Eddie Vedder. I will retain the original American (i.e. incorrect :P) spelling of words such as “colour”. I really like this song, and before blogging about this album I had not listened to either the album or this song in quite a few years. That is one of the great things about blogging about albums in this Rolling Stone Magazine 500 greatest albums list, I am either discovering new music or rediscovering music that I haven’t listened to in quite a while. In this song, Vedder’s voice is powerful and full of texture and depth, and the lyrics are great. I really like the way the song builds from a quiet, mournful song to a powerful “rock” ballad. Here is a video with lyrics of this great song. Enjoy! Which is your favourite Pearl Jam song? Do you own any of the albums from 490 to 481? Anyone who has looked at the night-time sky for any length of time will have noticed that stars have different colours. Some stars are red, some are white, and some are blue. A nice example of this can be seen in the Orion constellation. Betelgeuse, the star in the top left hand corner, has a distinct red colour, Rigel, the star in the bottom right hand corner, has a distinct blue colour, and Saiph, the star in the bottom left hand corner is white. 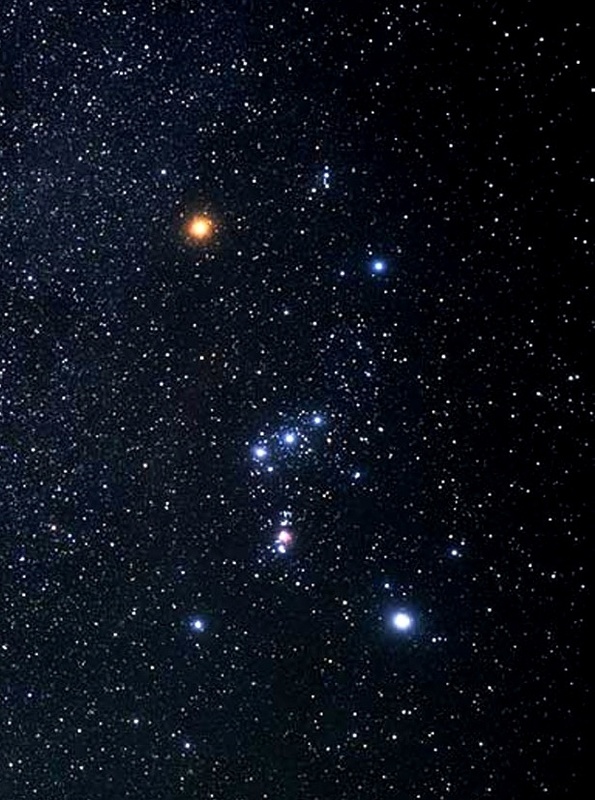 The Orion constellation. Betelgeuse in the top left is a distinct red colour, Rigel in the bottom right is a distinct blue colour, and Saiph in the bottom left is white. These differences in colour are due to stars having different surface temperatures. As the figure below shows, the blackbody curve peaks at different wavelengths depending on a star’s temperature, so a red star is cooler than a white star, which in turn is cooler than a blue star. This is because of Wien’s displacement law, which I discussed in this blog. Stars with different surface temperatures will appear to have different colours. This is due to their blackbody spectra peaking at different wavelengths. In 1817 the German scientist Joseph von Fraunhofer published a spectrum of the Sun showing the continuum spectrum which had long been familiar, but superimposed on this were a series of dark lines. These dark lines were shown by Kirchhoff and Bunsen in 1859 to be due to absorption lines being produced by different elements. I discussed absorption spectra in this blog. We now know that the gases which produce the absorption lines are in the atmosphere of the Sun. The visible surface of the Sun is called the photosphere, and it is the photosphere of the Sun which produces its blackbody spectrum. The overlying, thinner gases in the Sun’s atmosphere produce the numerous absorption lines which Fraunhofer saw. 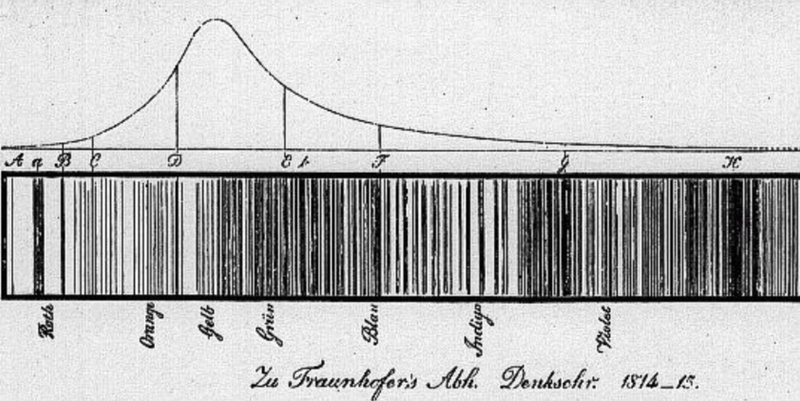 The spectrum of the Sun sketched by Fraunhofer in 1814/15, showing the dark lines he observed, superimposed on the Sun’s continuum spectrum. In the 1880s the Harvard College Observatory, under the Directorship of Edward C. Pickering, set about gathering the spectra of thousands of stars. The initial catalogue was published as the Draper Catalogue of Stellar Spectra in 1890. Williamina Fleming classified the spectrum using the letters of the alphabet, with with stars with the strongest Hydrogen absorption lines having the designation A, then the next strongest B, then C etc. The Harvard stellar classification scheme was originally in alphabetical order based on the strength of the hydrogen absorption lines of a star You can see in this figure how the strength of the Hydrogen absorption lines (e.g. the lines) are strongest for the A, B and F-type stars. 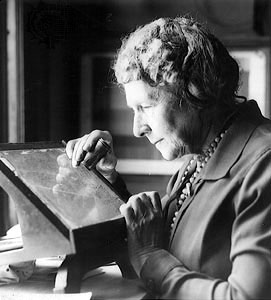 In 1901 Annie Jump Cannon revised the system. First of all she dropped most of the letters, leaving A,B,F,G,K,M and O. Secondly she subdivided each of these into 10 divisions, so for example A0, A1, A2…. A9. Thirdly, she re-ordered the letters based on the stars’ surface temperatures, not the strength of the Hydrogen line, with the hottest stars first. This is what has led to the O,B,A,F,G,K,M (Oh Be A Fine Girl/Guy Kiss Me) system we have today. The O-class stars are the hottest, the B-class stars the next hottest, all the way down to the M-class stars which are the coolest. 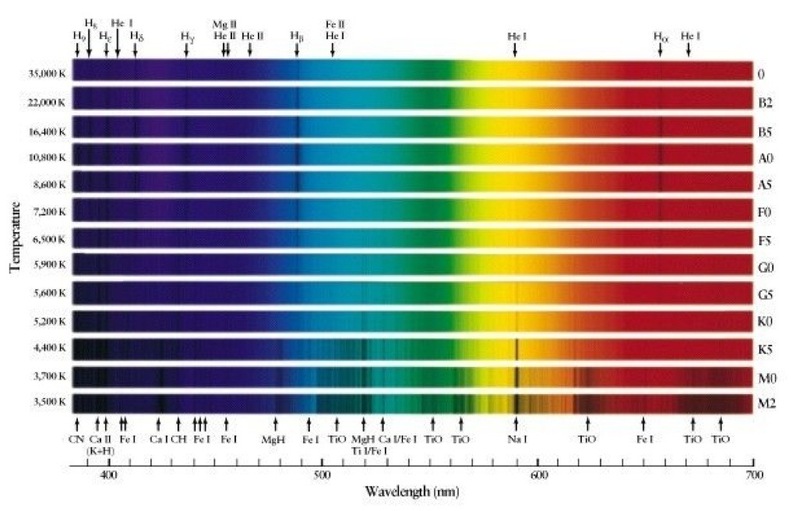 The figure below shows the variation of the strength of the absorption lines of different elements and their ions as a function of temperature. Stars which have the strongest Hydrogen lines (A-class stars) have a surface temperature of around 10,000 K. The bright star Vega is an A0-class star, and is white in appearance. The Sun is a G2-type star, and its strongest lines are the Calcium II lines (singly ionised Calcium). 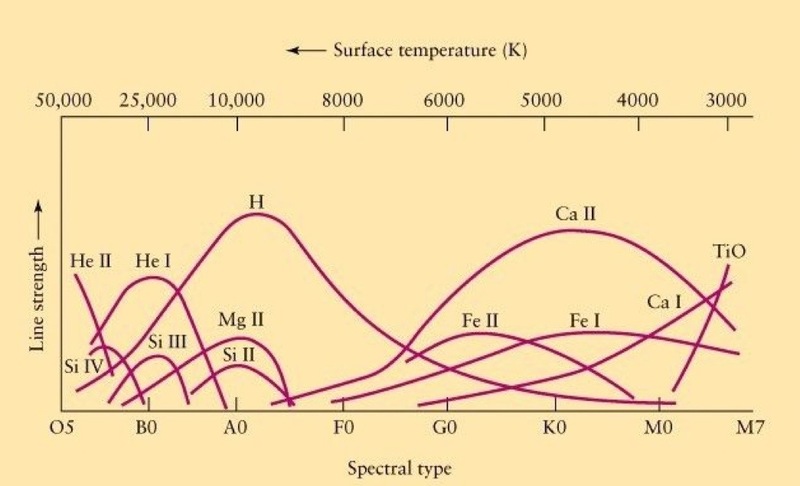 The strengths of the absorption lines of different elements (and their ions) as a function of temperature. The nomenclature e.g. Ca II means “singly ionised Calcium”, He I means “neutral Helium”, He II means “singly ionised Helium”, etc. The reason the strength of the Hydrogen absorption lines peak at around 10,000 K whereas the singly ionised Calcium lines (Ca II) peak at around 6,000 K is something I will explain in a future blog. It was an agonising way to lose a match. With 80 minutes up on the clock, Ireland were 22-17 ahead and looking at their first victory over current World Champions New Zealand in 109 years of matches between them. Ireland had the ball, and were picking and driving to run down the clock, just as they should. Then, for some bizarre reason, one of the Ireland players (I think it was the scrum half) kicked possession away, and the nightmare scenario unfolded. New Zealand scored a try in the 82nd minute, to level the scores at 22-22. Then, stupidly, the Irish players charged the conversion before the kicker had started his run up, so having missed the kick the kicker got a second chance and slotted it through the uprights, to win the game 24-22. Agony for Ireland, and as a fellow Celt I felt their pain. This really is a game that Ireland could have won. Not only could have, they should have. They were 19-0 up in the first half, with three tries to their credit with less than 20 minutes played. 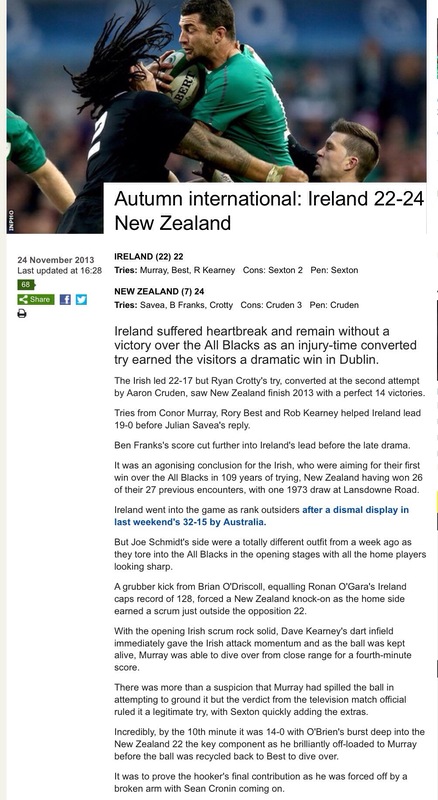 Even in the second half, when New Zealand started dominating, Ireland’s defence held firm. Ireland missed a very kickable penalty in the last 10 minutes which would have taken them into a 25-17 lead. But to be ahead with the 80 minutes up, to be in possession and to still lose the game is almost unforgivable. And, what I don’t understand is that the team who are most adept at running down the clock is the Irish region Munster. What on earth possessed Ireland to kick possession away when all they had to do was keep picking and driving and the game would have been theirs? They say that teams learn more from defeat than from victory, but this will be a very very harsh lesson for Ireland. Not only could they have recorded their first ever victory over New Zealand, but they could have also denied New Zealand becoming the first country in the professional era to go a whole calendar year winning every game (14 of them). Meanwhile, in Cardiff on Friday evening Wales put in a very mediocre display in beating Tonga 17-7. There were no scores in the second half, and I nearly fell asleep through boredom. Even the match commentators Eddie Butler and Jonathan Davies (both Welsh), referred to it as “dire”. Of course Wales’ big game is next Saturday against Australia, which I have said before could determine not only how Wales reflect on 2013 but also could determine how well we perform in the 2014 6 Nations. So I understand why Warren Gatland didn’t put out a full-strength team, he wanted to rest some players and also to give some players their first international experience. But, even a half-strength Welsh team should play better than that. We should be putting 30-40 points on teams like Tonga if we have pretensions to challenge for the World Cup in 1015. And, a convincing victory by that kind of margin would have done so much to boost our confidence ahead of next Saturday’s game against Australia. Instead, after a clinical and dominant display against Argentina last week, we were dragged down to the level of a mediocre team and failed to excel. I just hope we can come out next Saturday and end a so-far very good season by finally claiming a long-overdue victory over Australia! So much wasted and this moment keeps slipping away. 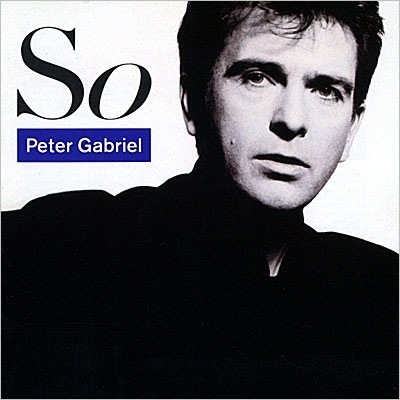 The first Peter Gabriel song I heard was his hit single “Solsbury Hill”, which got to number 20 in the DUK in 1977. I then discovered that he had been in the band Genesis, but I must say that I am not a fan of progressive rock and have never taken to the early Genesis albums. I only like their stuff after he left, but ironically I like a lot of Gabriel’s solo work. Which is your favourite Peter Gabriel song? Did you prefer him with Genesis, or his solo work?